Mangrove Bay Homes: Coastal living at its finest! This exquisite Coquina I furnished model is available for immediate occupancy. The residence features an open floor plan that includes a chef’s kitchen, casual dining and cozy living area under vaulted, tongue and groove ceilings all leading out to a spacious and tropical lanai with outdoor fire pit, kitchen, and private pool/spa with fireplace. Outstanding quality European oak floors, classic quartz countertops, custom milled cabinetry and top-of-the-line Thermador appliances make this three bedroom, three and one half bath home an owners dream in Mangrove Bay. Concrete block construction, standing seam metal roofing and natural gas feed provide peace of mind. Designed by MHK Architecture & Planning, the residence includes a gulf access private boat slip with purchase. The Amenity Building (scheduled completion late 2019) provides private on-site storage for resident’s kayaks, paddleboards and/or jet skis, a private community boat ramp and a wellness center with state-of-the-art workout equipment. Mangrove Bay is ideally located in historic Old Naples, mere blocks from phenomenal shopping, entertainment venues, and fine dining. Mangrove Bay Homes: Mangrove Bay - the newest luxury Waterfront community nestled along the Gordon River. Old Florida inspired architecture, by MHK Architecture & Planning, with Gulf access private boat slip included with the purchase. This Useppa III plan offers one of the BEST large water views of the Gordon River! Superior construction features luxury appointments throughout this residence encompassing approx. 4,100 SF under roof and 3-bedroom, 3 1/2 bathrooms, spacious flex space on the 2nd level, expansive 2nd story deck area, private guest house which including bedroom, bath, kitchenette and sitting area. This home includes (but not limited to), solid standing seam metal roofing, natural gas, private pool & spa area, custom crafted cabinetry and a Wolf/Subzero appliance package, roll down electric screens and hurricane system. Residents will be the recipients of luxury on-site Concierge and property management services. Luxury concierge building with private on-site storage for resident kayaks/paddleboards and/or jet skis, private community boat ramp and a wellness center with state of the art workout equipment. This home has been barely lived. Mangrove Bay Homes: Exquisitely furnished Keewaydin I model home is available for immediate occupancy in Mangrove Bay. Superior construction features and gorgeous appointments radiate throughout the residence including an upstairs loft living area. The outdoor kitchen and grilling station accent the magnificent integrated indoor/outdoor living space. The private pool/spa with fireplace, outdoor kitchen and grilling station overlooks stunning Mangrove filled surroundings and provides for everyday relaxation or entertaining family and friends. The cottage style luxury home has Old Florida coastal living inspired architecture and was designed by MHK Architecture & Planning. A Gulf access private boat slip is included with purchase. The Amenity Building (scheduled completion late 2019) provides private on-site storage for resident’s kayaks, paddleboards and/or jet skis, a private community boat ramp and a wellness center with state-of-the-art workout equipment. Mangrove Bay is ideally located in historic Old Naples, mere blocks from phenomenal shopping, entertainment venues, and fine dining. Mangrove Bay Homes: Superbly furnished Useppa I model home is available for immediate occupancy in Mangrove Bay. Superior construction features and sublime appointments feature throughout this three bedroom, three and one half bath residence, including an upstairs loft living space and expansive exterior deck. With concrete block construction, solid standing seam metal roofing, natural gas feed, and a private pool/spa, the home presents a refined, casual elegance. The coastal luxury continues with warm wood flooring throughout the residence, tongue and groove ceiling treatment in the living room and outdoor living area, quartz countertops, custom cabinetry, Wolf/Sub-Zero appliance package, and an outdoor kitchen with grilling station. Old Florida coastal inspired architecture, designed by MHK Architecture & Planning, with Gulf access private boat slip included with the purchase make this home the perfect place for family gatherings and entertaining. The Amenity center will provide storage for resident’s kayaks, paddleboards and private community boat ramp and a wellness center. Mangrove Bay is located in historic Old Naples, blocks from phenomenal shopping, entertainment venues, and fine dining. Mangrove Bay Homes: H.13879 Stunning 3 Bedroom, 3.5 Bath waterfront home in Mangrove Bay with Gulf access and covered boat slip with 16,000 lb lift. Superb location is just a ten minute walk to 5th Avenue. This significantly customized 3,607 square foot home, based on the Amelia model, has top level upgrades in every room. Dramatic foyer with 20 ft ceiling, beautiful Ruffino cabinets including den built-in’s and the main living area which also includes an incredible 13 ft bar with Sub-Zero wine cooler with beverage drawers, Sub-Zero ice maker and dishwasher. Quartz counters in the kitchen are accompanied by Wolf and Sub-Zero appliances and upgraded lighting. Home is equipped with Crestron system w/automation, security functions, and premium indoor/outdoor sound system. The generous living area extends outside where you will find a serene, covered space boasting expansive views of the Gordon River with a Wolf outdoor grill, cabinetry, television, and fireplace. Drop down electric screens combined with pocketing sliding glass doors open the entire home to the beautiful pool and spa area which enjoy southern exposure. This home offers unmatched value for waterfront living in downtown Naples. Exclusions. Mangrove Bay Homes: Stellar location in historic Old Naples and situated inside a waterfront community. Amelia Model exemplifying an open concept living with a master suite overlooking the water. Perfect for entertaining, the great room seamlessly flows to a partial covered outdoor space, pool, spa and lounging area all on a single story. Modern living with this 3 bed plus den, 3.5 baths, front entry garage offers upgraded features, move-in ready. Upgrades not limited to, paver driveway, solid wood barn doors, plank collection wood flooring, marble & silestone counter tops, decorative shiplap ceilings, fireplaces, frameless shower, soaking tub, basket weave and calcutta mosaic tiles, custom crafted cabinetry and lighting, Thermador appliances, tongue & groove walls, butlers pantry, glass mosaic pool tile, additional decking, fencing, outdoor kitchen, and roll down screen. Amenity lot with backyard access to dock and covered boat-slip. Pool care, exterior landscaping maintained by the Association. Old Naples cottage-style luxury home complete with private pool and individual boat slip. Mangrove Bay Homes: Casually elegant, fully furnished Coquina II model home located in Mangrove Bay is available for immediate occupancy. Old Florida inspired architecture, accompanied by superior construction and exquisite appointments throughout the residence include an upstairs loft living space providing an exceptional place for family gatherings or entertaining. The home features concrete block construction, standing seam metal roofing, natural gas feed, and a private pool/spa with fireplace. With luxurious wood flooring throughout the home, tongue and groove ceiling treatment in the living room and outdoor living area, quartz countertops, custom cabinetry, Thermador appliance package, and an outdoor kitchen with grilling station, the home offers exceptional style. The cottage style home was designed by MHK Architecture & Planning and includes a gulf access private boat slip with purchase. The Amenity Center will provide private on-site storage for resident’s kayaks, paddleboards and/or jet skis, a private community boat ramp and a wellness center with state-of-the-art workout equipment. Mangrove Bay is located in historic Old Naples, blocks from shopping, entertainment venues, and fine dining. Mangrove Bay Homes: Flawless elegance abounds in this fully furnished Coquina II model home located in Mangrove Bay. Old Florida inspired architecture, accompanied by superior construction and exquisite appointments throughout the residence include an upstairs loft living space providing an exceptional place for family gatherings or entertaining. The home features concrete block construction, standing seam metal roofing, and natural gas. Oak flooring throughout the home, coupled with tongue and groove ceiling treatment in living room and outdoor living area, quartz countertops, custom cabinetry and Thermador appliance package offer exceptional style. The private pool/spa with fireplace, outdoor kitchen area with grilling station are perfect for entertaining. This cottage style luxury home has Old Florida coastal living inspired architecture and was designed by MHK Architecture & Planning. A Gulf access private boat slip is included with purchase. The Amenity center will provide private storage for resident’s kayaks/paddleboards, a private community boat ramp and a wellness center. Mangrove Bay is located in historic Old Naples, blocks from phenomenal shopping, entertainment venues, and fine dining. Mangrove Bay Homes: This floorplan is "The Palm Cottage" it is a Soon to be Completed Home on Lot #5 in Mangrove Bay, New Luxury Homes in a Waterfront Community, along the Gordon River. Superior construction features and luxury appointments throughout this Single-Story residence encompassing approx. 2,514 SF under roof and a 3-bedroom, 2.5 baths floor plan include (but not limited to) solid standing seam metal roofing, natural gas, hardwood floors throughout entire home, custom crafted cabinetry, Thermadore appliance package, volume ceilings in the living room and master bedroom suite, private pool, outdoor kitchen, outdoor fireplace, electric screens on lanai and hurricane rated doors and windows. Old Florida inspired architecture, designed by MHK Architecture & Planning, with Gulf access private boat slip included with the purchase. Full Concierge Services and Amenity Building (Completion Late 2019) with private on-site storage for resident kayaks/paddleboards and/or jet skis, private community boat ramp and a wellness center with state of the art workout equipment. Mangrove Bay Homes: This floorplan is "The Coquina I" and is an awesome Pre-Construction opportunity on Lot #11 in Mangrove Bay, New Luxury Homes in a Waterfront Community, along the Gordon River. Superior construction features and luxury appointments throughout this Two-Story residence encompassing approx. 2,664 SF under roof and a 3-bedroom, 2.5 baths floor plan include (but not limited to) solid standing seam metal roofing, natural gas, hardwood floors throughout entire home, custom crafted cabinetry, Thermadore appliance package, volume ceilings in the living room and master bedroom suite, private pool, outdoor kitchen, outdoor fireplace, electric screens on lanai and hurricane rated doors and windows. Old Florida inspired architecture, designed by MHK Architecture & Planning, with Gulf access private boat slip included with the purchase. Full Concierge Services and Amenity Building (Completion Late 2019) with private on-site storage for resident kayaks/paddleboards and/or jet skis, private community boat ramp and a wellness center with state of the art workout equipment. Mangrove Bay Homes: This floorplan is "The Palm Cottage" it is a Pre-Construction Opportunity on Lot #4 in Mangrove Bay, New Luxury Homes in a Waterfront Community, along the Gordon River. Superior construction features and luxury appointments throughout this Single-Story residence encompassing approx. 2,514 SF under roof and a 3-bedroom, 2.5 baths floor plan include (but not limited to) solid standing seam metal roofing, natural gas, hardwood floors throughout entire home, custom crafted cabinetry, Thermadore appliance package, volume ceilings in the living room and master bedroom suite, private pool, outdoor kitchen, outdoor fireplace, electric screens on lanai and hurricane rated doors and windows. Old Florida inspired architecture, designed by MHK Architecture & Planning, with Gulf access private boat slip included with the purchase. Full Concierge Services and Amenity Building (Completion Late 2019) with private on-site storage for resident kayaks/paddleboards and/or jet skis, private community boat ramp and a wellness center with state of the art workout equipment. 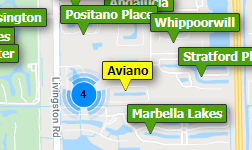 Need professional assistance selling your property at Mangrove Bay Naples? Find out how an Area Specialist can help to generate more property exposure in order to get the most money for your investment in the least amount of time.